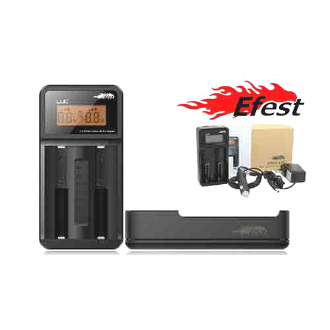 The Efest LUC V2, made by Efestpower is a 2 slot LED charger that is compatible with most of the 3.7V batteries on the market. It's mini LED screen keeps you informed of the voltage and battery capacity level and has over-discharge, over-voltage, short-circuit and reverse polarity protection. It will automatically shut off when the battery is fully charged and will also automatically adjust the current to charge different sized batteries. FEATURES: Charging input: Pressing the rectangle button can change the charging modes (0.5A/1A/2A) and charge different size 3.6V/3.7V Li-ion batteries. Built-in reverse polarity protection: While the charger is connected, each charging channel has reverse polarity protection, the charging light is still green and will prevent any short circuit. Over-charging protection: Once the external power is connected with the LUC V4 charger, the charger will stop charging when batteries are full. NOTE: Use Rechargeable Batteries or With PCB Batteries. Other types of batteries may cause personal injury or battery damage. Do NOT leave batteries charging unattended/overnight!